Unsolicited comments – both positive and negative – about The Fatima Center and Father Gruner are all part of the experience that comes with working for Our Lady’s Apostolate. Most common are comments demonstrating recognition of the apostolate and Father as promoting the Message of Fatima – even if intended to falsely malign either or both. There is, however, another type of comment frequently made to staff, that isn’t something generally associated with the apostolate or Father, but nonetheless is heard often enough to be significant, and is evoked by mere mention of, or reference to, the name of Father Gruner. The first time I heard it was twenty years ago. Shortly after opening the new office in Fatima, Portugal, with permission from the head office in Canada, another staff member and I travelled to Poland. The purpose was to visit a Marian priest there who had recently established a traditional Catholic chapel in Warsaw, and was working to re-introduce Polish Catholics to Tradition, while reviving devotion to Our Lady via the work of St. Maximillian Kolbe. It was marvelous to meet fervent traditional Catholics in a fast-growing fledgling community in another part of the world. Assured that many in Poland could read English, with the permission of the priest we had brought with us a supply of various pieces of literature produced by the apostolate explaining the Fatima Message. On one particular evening, as parishioners began to arrive for an all-night Exposition of the Blessed Sacrament, some took a few minutes to greet the priest and one another in the Refectory room of the priory and saw the literature from Our Lady’s Apostolate which had been placed on a table for parishioners to take. One young man, who looked to be in his early thirties, approached me after seeing the literature and, since I do not speak Polish, asked me a question in English – though with great difficulty. Imagine my surprise at hearing those words for the first time. I was in a distant country in whose language the apostolate had never published, and a stranger who could barely speak English was announcing to me and anyone close enough to hear, that his introduction to Catholic Tradition was because of the work of Father Gruner. Immediately after Father Gruner’s death and for many months after, The Fatima Center was inundated with emails, letters and phone calls from priests, religious and lay people who, after extending their condolences and expressing their sorrow at the loss of Father, ended with conveying their appreciation for Father and his work as being instrumental in returning to the Catholic Faith and/or being led to (or introduced to) Tradition. It was extraordinarily moving and edifying. Even now, more than three years after Father’s death, we still receive phone calls, emails and letters from supporters and others lamenting never having met Father, and subsequently expressing their appreciation for his role in their spiritual lives. 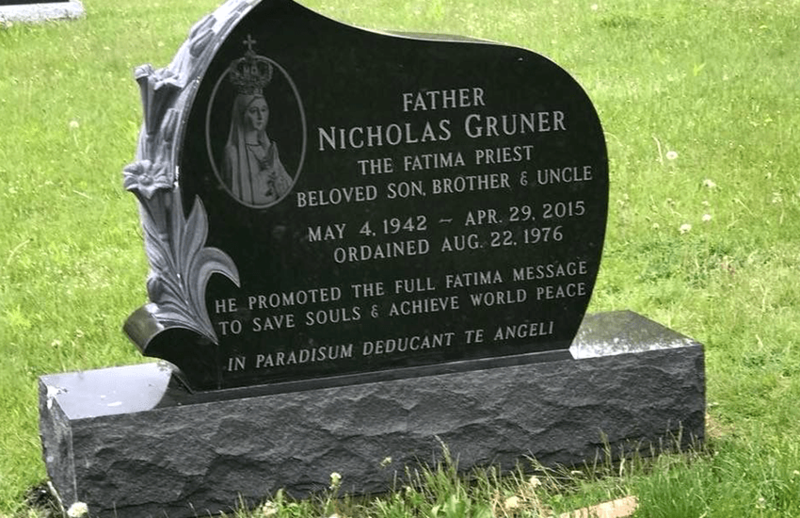 After the gentleman in Poland credited Father Gruner for finding the path to Tradition, Father Karl Stehlin (the parish priest) said to me, “Make sure you tell that to Father Gruner” – and I did. Rest in peace, Father Gruner. The number of souls saved because of the work you did will be made known at the General Judgment.